Customers can submit testimonial with login or without login. Customer can also upload picture. Customers can also submit video testimonial. 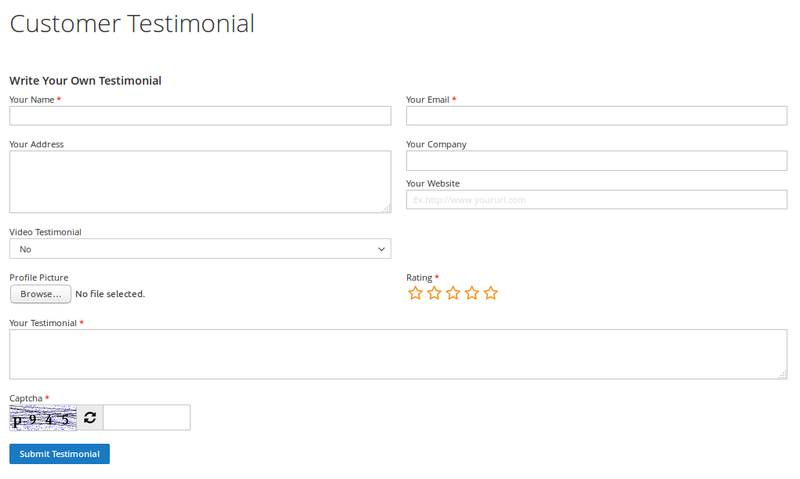 Frontend slider display for testimonials. Manage testimonials completely from Backend. Backend option for change status of testimonials [Approved/ Pending/ Not Approved]. When new testimonial created then notification email send to customer and admin both. Once admin approved testimonial then email send to customer. Provide widget feature for display testimonial slider easily . 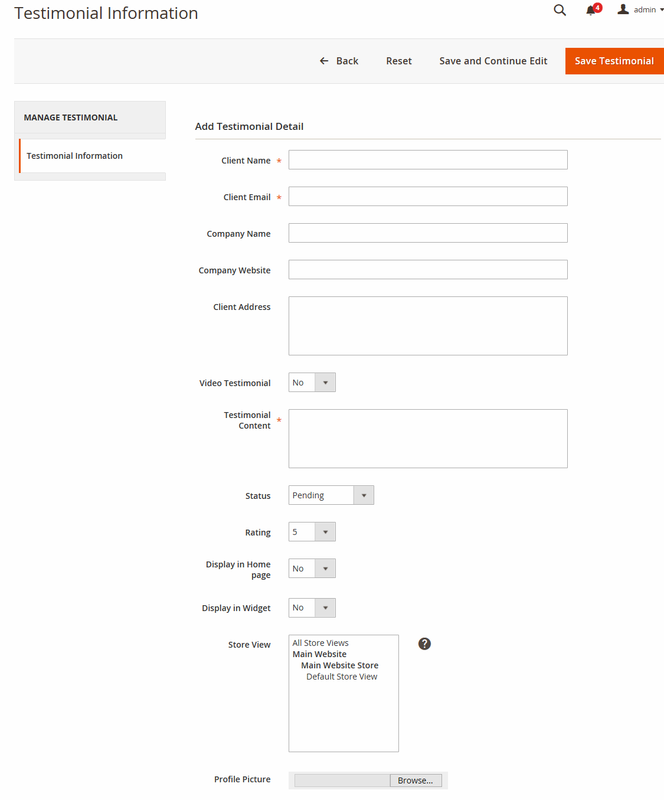 Complete testimonial settings given into admin like email notifications, widget options, different settings of testimonials listing and testimonial form. Include Installation Service +$39.00 If you are not familiar with installion of Magento extensions, then please do not hesitate to order our installation service. The installation will be completed within 12 hours(except National Holidays OR weekends) by our Support Center once the login access details of your hosting server has been received. Note: Installation work will start once customer/client provides all the working details acceptable by support team, so please make sure to provide all correct and working details to avoid any delays. Include Design & Configuration Service +$75.00 If you are not familiar with CSS/style formatting codes then please order design and configuration service and our Support Center will set up the color scheme as per your template. The service will be completed within 24 hours(except National Holidays OR Weekends) by our Support Center once the login access details of your hosting server has been received. Note: Design and Configuration service will start once customer/client provides all the working details acceptable by support team, so please make sure to provide all correct and working details to avoid any delays. Customer Testimonial Pro extension helps your customer to write about your products, services, stores. It helps to increase your market values. Our Customer Testimonial Pro Extension provides view, submit testimonial, and provide configuration setting for show/hide customer details and options for better Look and Feel. 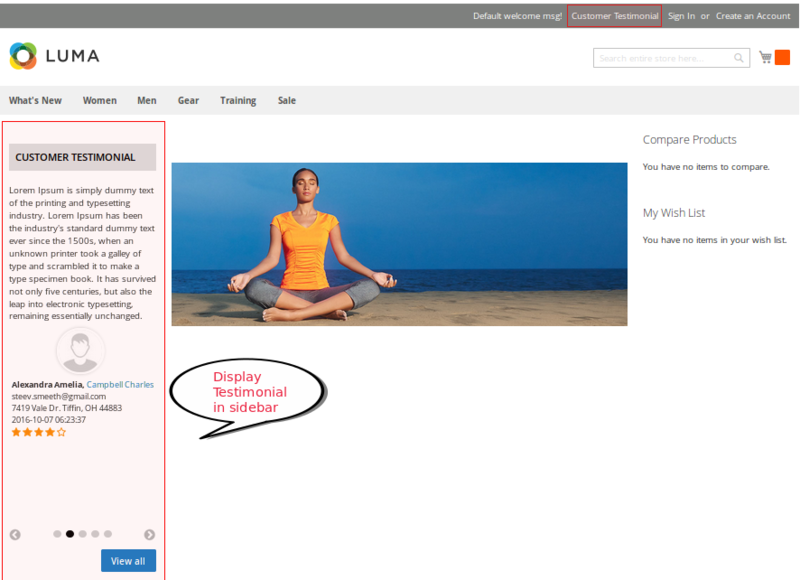 You can display testimonial in slider using widget of customer testimonial. You can display approved testimonial list in frontend using package code from configuartion. 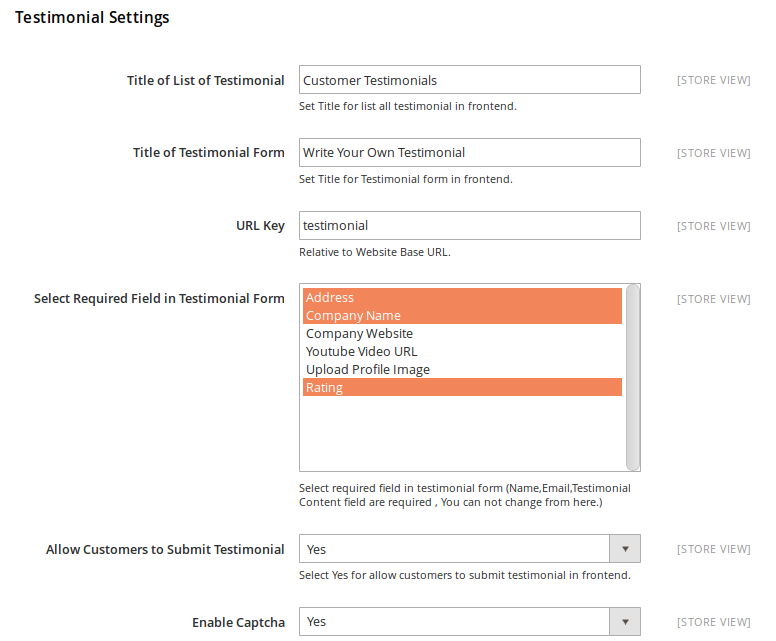 You can allow customer to submit testimonial in frontend from configuration settings. 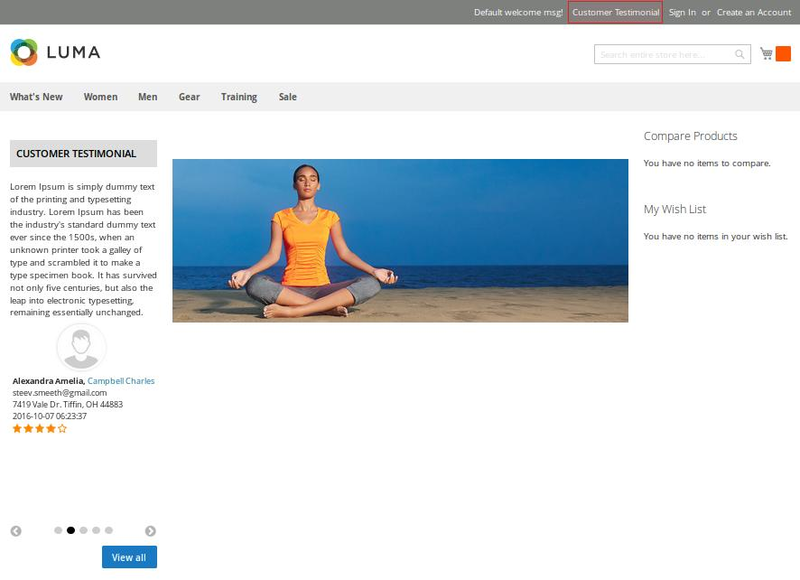 You can display Toplink in header for Customer Testimonial in frontend and you can also change title for it. Manage youtube video url , status of testimonial , rating. Choose yes for display testimonial in widget and home page . XML Tag Representation: Add xml code for display testimonial in layout file. 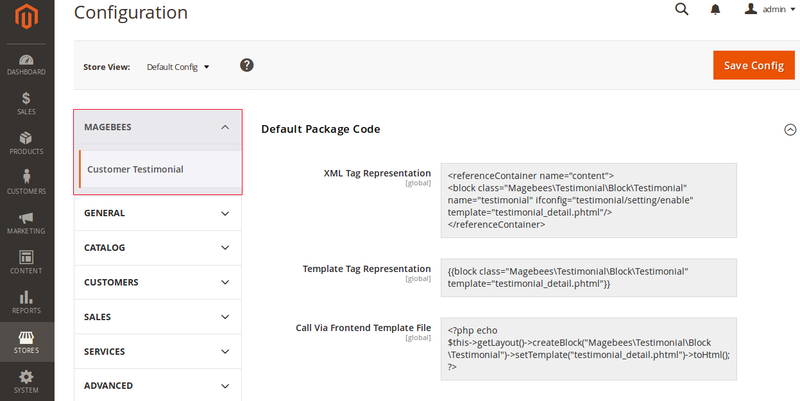 Template Tag Representation: Block code for display testimonial in CMS pages. Call Via Frontend Template File : Use this code in any phtml file for display testimonial list. Manage enabled / disabled module from here . Show/Hide and change title of Toplink for testimonial. 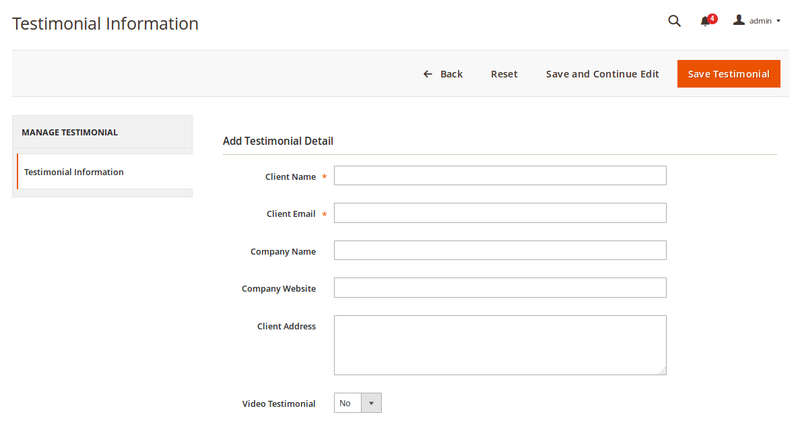 Add Custom testimonial slider , testimonial list testimonial form title. 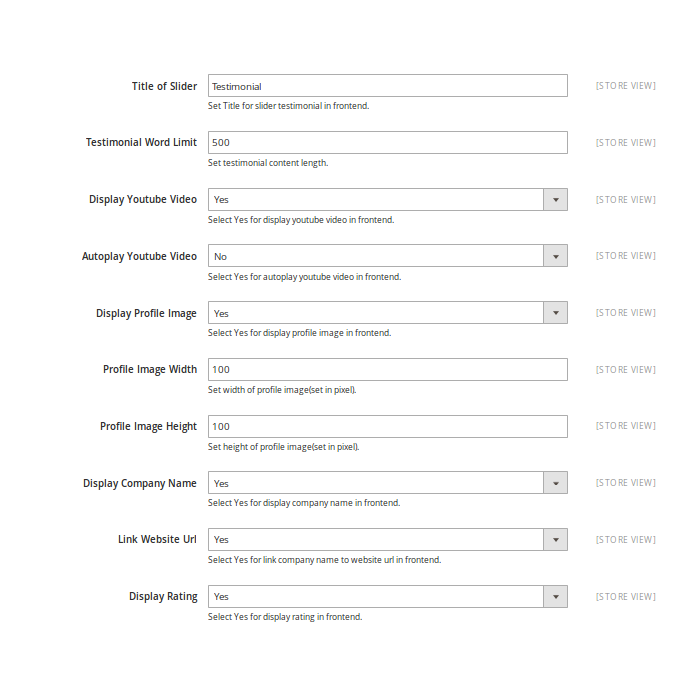 Apply Custom length of testimonial content in slider. Manage url key for route. Set required field for testimonial form. Enabled / Disabled captcha code for avoid spam. Manage mail template , admin mail address and subject of mail. Send mail to customer when approved testimonial. Manage mail template , subject for post testimonial mail subject and approved testimonial mail subject. Display Testimonial Slider using widget. 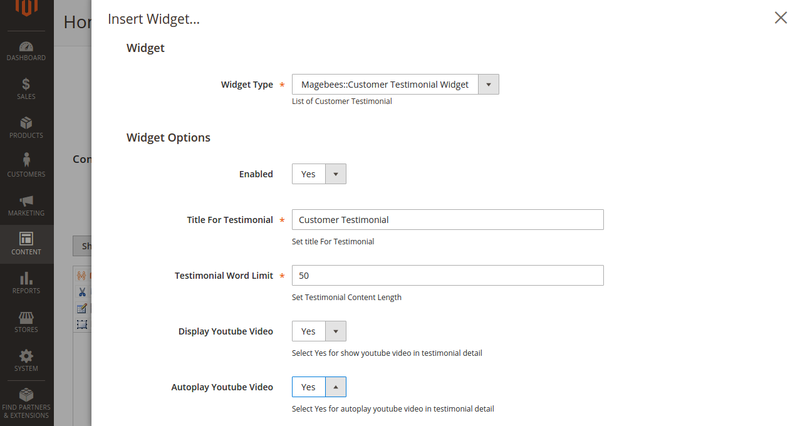 Select Magebees:Customer Testimonial Widget type. 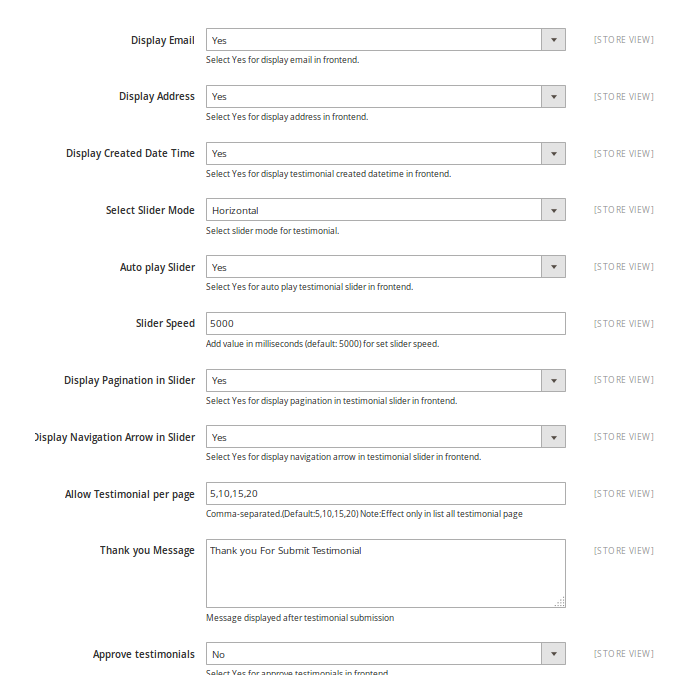 Create testimonial and set layout. Manage testimonial using testimonial widget setting options. Fantastic customer support on our M2 site for Customer Testimonials Pro. Thank you! Video testimonials are now possible! 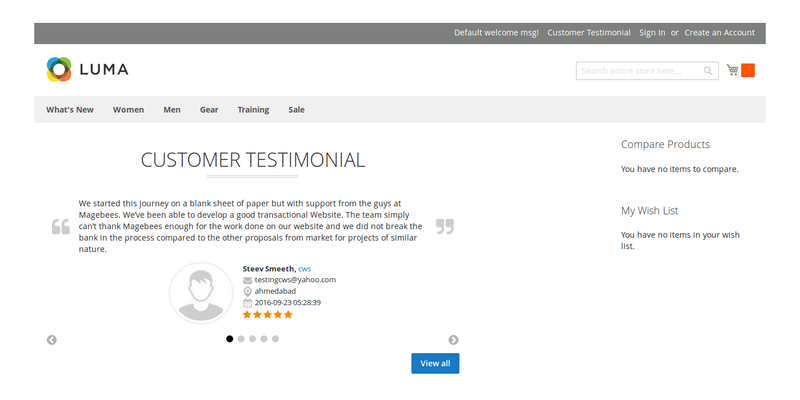 I am glad that i chose MageBees.com for buying the customer testimonial extension. Now, my customers can share their reviews by simply uploading a video. Customers do not need to log in to their account to share their reviews. Overall, the extension is easy to use and doesn't require more than a few minutes to install. Go for it. You won't be disappointed. 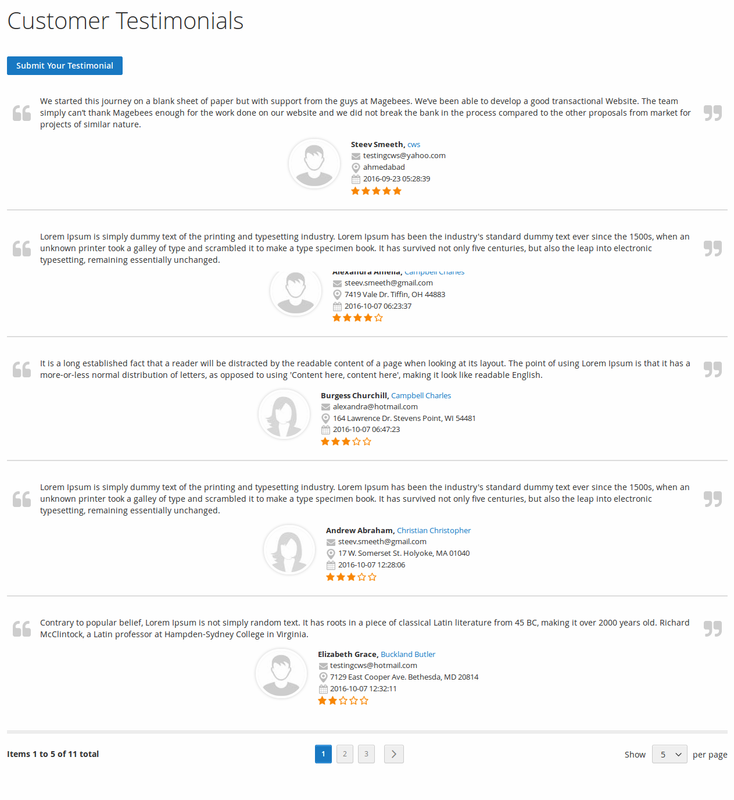 Customer Testimonials Pro is must extension for all the magento stores to show the feed back for their clients .We used this extension and very happy with it. Particularly features and an extraordinary Support! Your Customer Testimonial Module is take care of my concern. Using this extension, I can show customers review and monitor customer's review on a day by day essentials. The extension is straightforward and simple to install. I need to modify the style so it's suitable with my theme, and Magebees have done it for me and they did quick. That is best support I have ever observed. Much appreciated Magebees, Highly recommended to each one. Did all that we required it to do thus simple to utilize. Exceptionally adaptable with numerous highlights. Furthermore, the support is astonishing. Excellent testimonial extension with complete features which we are looking for. Support team help us to configure it correctly on our store. Decent testimonial module. Recommend to all who wants to show testimonial of their clients into their store. I need to recommended this extension to each one. Since I'm utilizing this and I content with this extension. The support is likewise extremely extraordinary and accommodating. Does exactly what it says and easy to use it. With the help of widget, I can setup this extension into my store different page easily. Slider works like a charm. I reviewed many other company extensions but this extension provide superior then all with features, document and great support. Easy to install, no problems after that. With own adjustments you get help from the friendly support. Highly recommendet! Thank you. => Fixed pagination issue in customer testimonial list. => Add widget template for display all testimonial using widget. => Make compatible with latest magento version. Q-1: I have tried to install Customer Testimonial Pro extension using terminal, but I am not able to install using command line, what are steps for custom installation of Customer Testimonial Pro extension?? Ans : Please contact us for install our module in your store Contact us. Q-2: I am getting error in console for cwstestimonial.js not found , How to solve this problem ? Ans : Go to admin -> SYSTEM-> Cache Management. Refresh the page in Frontend. How to Install Authorize.net Direct Post Signature Key Patch with or without SSH in Magento1 & Magento2? Magento 2 Database Backup Missing Table Error "inventory_stock_1"
Copyright © 2015-2019 Mage Bees Reserved All Rights. A Venture by Capacity Web Solutions. All other trademarks and logos are used for identification purposes only and are the rights of their exclusive owners.